THE JAPANESE TRADITION OF SUIKAWARI (WATERMELON CRACKING) - What About Watermelon? In Western culture, the piñata has become a party favorite. After all, who doesn’t love beating the stuffing out of something with a stick now and then? It’s also yielded more than its fair share of hilarious videos. Any time you put a stick in the hands of a five-year-old, blindfold him, spin him around a few times and tell him to swing said stick in a room full of people, bad things are bound to happen to people standing within 10 feet. The rules are similar to piñata. A watermelon is laid out, sometimes on a tarp, and participants one by one attempt to smash it open. Each is blindfolded, spun around three times, and handed a wooden stick, or bokken, to strike with. The first to crack the watermelon open wins. Afterward, the chunks of watermelon produced are shared among participants. 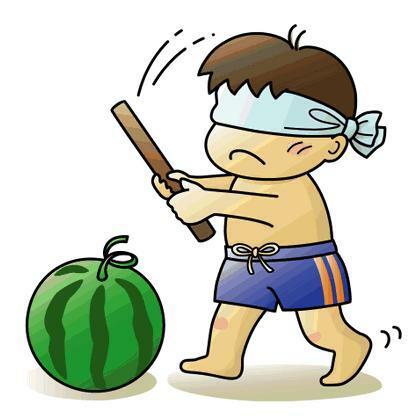 I’m happy to see that the stick, blindfold and spinning are still part of the game, even though I feel kind of bad for the watermelon. What’s missing is the candy that rains from the ceiling, but to be quite honest, I’d rather have pieces of watermelon anyhow! Below is a video of a game of suikawari. In this one, the watermelon wins!